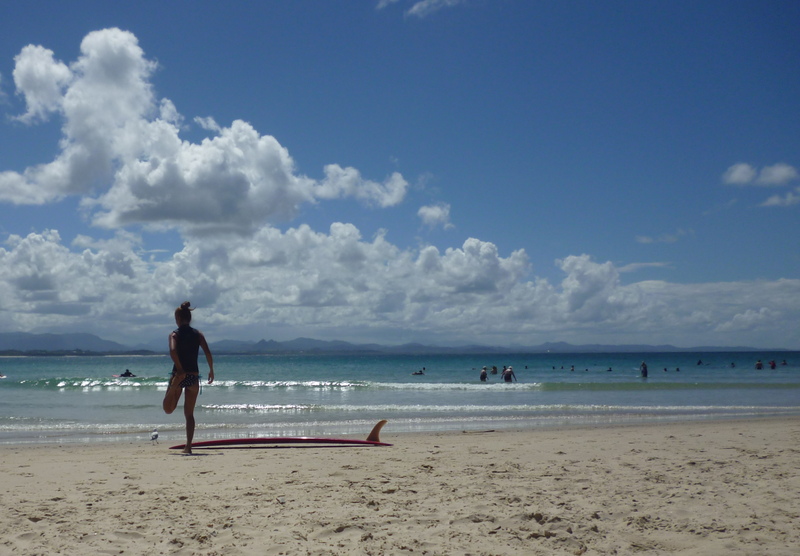 I was spending over a month living with friends and their children in Suffolk Park near Byron Bay, avoiding nits, going for runs on a beautiful, wide sandy beach and getting in the water whenever the mood took me. I was also rather unsuccessfully searching for work. I made friends with other backpackers, people I hitchhiked with and via CouchSurfing. I went climbing and met a good little crew of mixed souls, friends of my friends took me out (out of pity or novelty, I’m not sure), and I drank and danced and hung out on the beach until the early hours with groups of lovely locals and traveller types. It was when I realised that it was the third time in less than a week that I was sneaking into a dark, quiet house that I thought: I need to be a bit careful. Comments had been made about my love of sleeping in. How it was like living with a teenager. And although I just needed to let go, have some fun, I knew that I also needed to better fit with where I was staying. Last year, apart from a stint in Lima where a great-aunt kindly opened her doors to me and a travel buddy, I hostelled it through Ecuador and Peru. Since I arrived into Australasia, however, I had been incredibly lucky to predominantly stay with a host of wonderful, familiar people. It was a much needed change from hostel life and the constant stream of strangers. In a hostel, you can do whatever the hell you like: go to bed at 04:00am, miss breakfast, wake up at midday, sleep in the afternoon. Your bed even gets made for you. You can cook if you like, eat out when the fancy takes you. In short, it’s quite a selfish existence. When staying with family and friends, their routines are already set. In order to stay on good terms, it’s pretty essential to be considerate and not treat their place as a hotel. My friends in Byron are some of the most relaxed people I know. They wanted me to have fun, to enjoy myself. They were glad that I was making friends and socialising and seeing the area. They were grateful when I did the washing up, happy when I got involved with family stuff. We came up with some agreements about what I could do to earn my keep. I picked the kids up from school every now and then, stocked up on groceries, cooked at least once a week. I did some babysitting, insisted the couple went out on a date or two whilst I kept the kids entertained. It didn’t feel enough. From my point of view. Here I was, staying with people who knew me better than most I’d met on my journeying, chatting about things other than my next destination. I had my own space, somewhere to hang up my clothes. And a warm welcome to help me relax into stopping for a moment. So I made sure to do little additional tasks: washing up, hanging up the laundry, little jobs around the house. I tried to be aware and helpful. I kept my room tidy, replaced toilet paper when it ran out. Small things to keep the cogs of the family machine running smoothly. And then I realised: when I’m next settled somewhere, I’ll be in a position to do this for someone else. Maybe that’s what it’s all about. Being considerate in the now, but passing on the welcome in the future. Book in now for your bed. Oh, Byron. You are beautiful and when the sun shines, everyone smiles and warmth radiates out of your core. You attract so many different people with your immense energy: lost souls, surfaholics, backpackers, yogis, hedonists, spiritualists, and everything in between. But unfortunately you also attract some bad people. People who think nothing of cutting apart a chain and lock, bundling yet another bike into the back of a truck and then trying to make a quick sale further up the coast. The police are polite and take details but don’t expect to see the bikes again. It’s sad to hear how common it is to get cycles stolen. One girl I chatted to was onto her fourth bike in three months. And then there’s the case of my bike helmet. Why steal a helmet from next to a bike with a baby seat? Where’s your conscience? My friends, the owners of the bike and helmet were understanding, but it soured my feelings towards you a little. Broke some of the trust. And my friend Julie. She loved her set of wheels. I mean really adored them. Her bike wasn’t a fancy thing. In all honesty, it was a bit of an old and battered city cruiser but she found it to be beautiful. And she relied on it to get her to work every day. 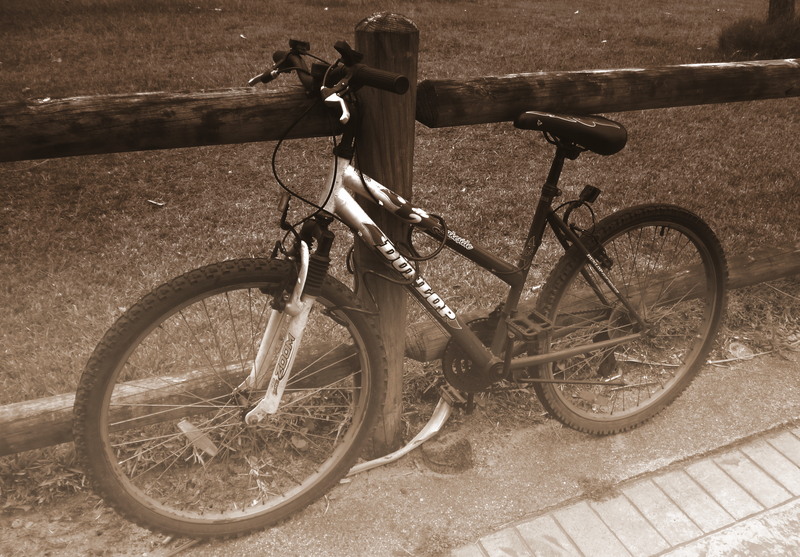 And then one night, some of your bad citizens snuck out whilst she worked her second job of the day and whisked her beautiful bike far away, leaving Julie stranded at midnight, six kilometres from home. Feel good? Ah, Byron. Whilst I like so much about you, I am holding back from letting myself be fully seduced. I have loved cycling your paths every day and really appreciate the respect given to cyclists on the road. Maybe your bad sides help to accentuate your positives, but seriously, do you really want to make more people like Julie sad and frustrated? Thought not. Whatever your perception of the Spirit Festival, whatever your inhibitions or expectations were, the weekend long multi-venue event in Mullumbimby left spirits high for all involved. As your common Byron Shire surfer, teacher and beer drinker, I wouldn’t class myself as a devoted spiritual guru or devoted yogi by any means. And as a regular guy, that includes the odd yoga class every now and then. I was pleasantly surprised and grateful for experiences I was offered and the diversity of classes that made me look inward rather than out for a change. There were 22 different sessions offered on the half day Friday (not including the high-spirited good times had during the evening concerts). Plus, 43 sessions on the programme for Saturday and equal number on the Sunday. A third in attendance were beautiful men and the rest were radiating females exploring their divine feminine. Filled with caring compassionate everyday people, I was amazed at the lack of hippy-trippy patchouli oil smelling folk I thought I would see there. Instead it was genuine, bright-eyed, smiling faces dressed in modern colourful sport wear and talking excitedly about the experience they just had at one of the many sessions on offer. Mix in the colour of the peace flags, the Tee-Pee’s, the colour of the graceful skies and the opposing healthy green grass or the many rugs and cushions that were on offer for all and I found a truly well decorated and catered for event. Of course the expectations of great tasting, super nutritious food was met. There were also stall holders selling their products, others offering various therapies or spiritual readings etc. However they weren’t the focus. The focus was very much on the programmed sessions, the entertainment and the gurus who made them a reality. The level of professionalism and knowledge shown by these teachers/spiritual practitioners was very deep, very much like a university professor or TED speaker. They offered very informative and well lead journeys for the punter to embrace through mind, body and consciousness. I was one for one, after experiencing Darpan’s ‘Shamanic Sound Journey’ class. This was the very first class I under took and I had my first positive journey for the weekend. He was able to tap into this body that I carry around day-to-day and predominately use only for external use, looking, seeing, touching and so forth. And open me up to expose the beauty of looking inside my exo-skeleton and the senses/ power/ energy within. And since doing so, it may have helped me find the love in my heart that’s been missing for many years. Another highlight for many who packed the venue, beyond its capacity, was ‘The Future Sound of Yoga’. A modern yoga delivery that combines a DJ like character offering wicked symphonic and electro sounds, combined with the gorgeous passionate smiling Angel as facilitator. They offered yoga poses and dance steps to be conducted with free expression yet offering a basis of directed movement. And so the list of amazing classes went on; the renowned yoga guru’s educated in ancient languages such as Sanskrit doing their bit, Tigress yoga aimed at empowering the feminine, Women’s only Tantra or mixed Tantra sessions, yoga in the public pool, belly dancing in the Drill Hall, Kirtan in the open, Goyto Monks humming their mantras and chai tea everywhere. However, it was the Mullum High School Hall that was the focal point once the sun went down. Saturday’s headlining act, Deva Premal, exposed me to Kirtan and the empowerment of vocalizing mantras. All good stuff, but the more familiar all out dance sessions on Friday and Sunday nights was more my cup of tea. Thanks to OKA, Deya Dova and Future Sound of Yoga, the transformed school hall was alive with a packed house moving like perfect swell hitting a reef break. Perhaps high on chai tea, or whatever, undisputedly the dance floor was absolutely pumping yet no one was inebriated. 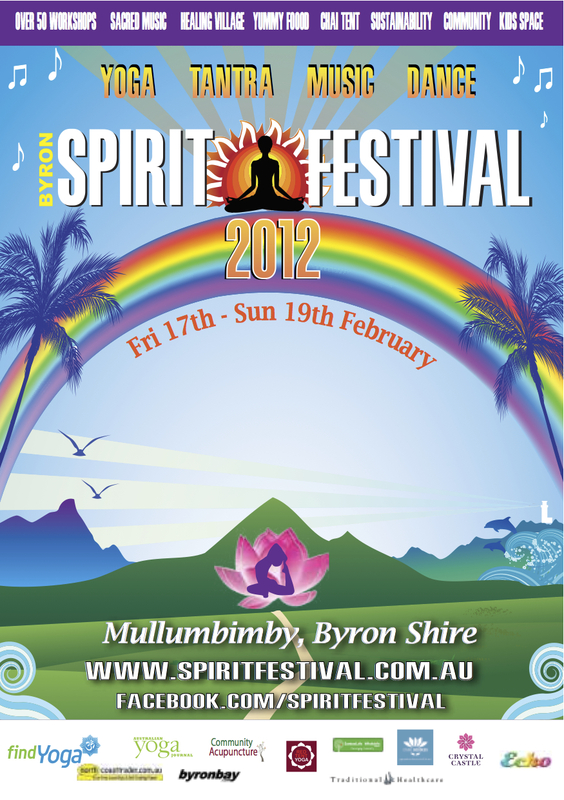 The Spirit Festival, as participated by a regular Byron local like myself, was one of the best festivals I have experienced in my life. I met so many genuinely gorgeous people, experienced new things, expanded my perceptions and explored my conscious being. I also spoke with the festival organizers and they indicated it was a successful first year, on many levels. They were exceptionally pleased that they could offer several volunteer performers, part of proceeds that were raised from high ticket sales after all. Chad is a keen surfer and skater and a good guy all the way. And open minded enough to open up to the Spirit Festival. Chad is also an Australian writer and the founder of Active Kids Books. He draws inspiration from his interesting and varied life as a sponsored snowboarder, footballer, fitness instructor, business owner, PDHPE teacher and father. His books aim to challenge the lack of sports related picture books for children. Currently available: Skate Session and Surf Safari. Check out the website and video on the front page for more info.